For a non-agricultural product such as shampoo to bear ‘organic’ on the label, it must meet regulations which require the shampoo to have agricultural ingredients. These regulations are set forth by the National Organic Program. Within organic shampoo, there must be a certain percentage of the ingredients that are agricultural. Also, components listed as organic are in the ingredient list without showing a ‘made with organic’ label on the front of the product. We’ve put together everything you need to know about organic shampoo and all the best products. The best brands offer sulfate and paraben free shampoo for natural hair. Organic shampoo will add shine to your hair, balance scalp oiliness, and clean impurities from your hair. The best shampoos available will not only clean your hair and scalp but nourish your hair follicles and encourage growth. For shampoo with all of these features, you may want to try Balance Shampoo by Josh Rosebrook. 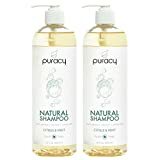 This shampoo is also available as a shampoo and conditioner combo. The all-natural ingredient list is a big plus and as an added bonus, it has a great, clean scent! Rahua has developed an excellent aloe leaf extract based Classic Shampoo and Conditioner set. The ingredients contained in the product increase the bounciness of your hair and reduce frizz. Rahua Classic Conditioner also doubles as a styling cream. This product does contain a plant-derived preservative, potassium sorbate. It has a basic but potent ingredient list. Rahua makes one of the best organic shampoos for color treated hair. Brings Out The Best In All Hair Types Without The Chemical Suds! If you want to enjoy the benefits of sea buckthorn oil, try Seabuckthorn Shampoo by Living Libations. The formula also includes rosemary extract, fatty acids, and antioxidants. This is an ideal shampoo to select if you want to increase the strength of your hair. The formula contains less common and beneficial ingredients such as coltsfoot, bladderwrack seaweed in jojoba oil, and sage among others. The exclusivity and benefits of the ingredients really set this product apart. Rahua has also developed Earth Mother, an organic and vegan dry shampoo. It is an all-natural non-aerosol shampoo with ingredients derived from plants. Earth Mother effectively cleans the hair shaft, lifting roots and adding volume. Ingredients include absorbent cassava and cosmetic clay, as well as antiseptic star anise. Products that bear the organic label must have no less than 95 percent of agricultural products. The remaining ingredients in the product have to be produced organically unless they are not commercially available as organic or not an agricultural product. If there are less than 70% organic ingredients in the shampoo, it cannot bear the ‘organic’ label, the USDA seal, or any other kind of organic certification seal. However, all organic ingredients must be identifiable by an asterisk on the ingredient list. What does the “made with organic” standard mean? A shampoo label may read “made with organic” as long as it does not list more than three organic ingredients. If a product has “made with organic” on the label, it needs to bear the logo of the certifying agent who finished the product. The USDA does not regulate the term ‘organic’ as it applies to body care products. However, the USDA does regulate product ingredients, which is why some shampoos will bear the USDA Organic seal. Most traditional shampoos contain low quality, synthetic ingredients. These shampoos contain large amounts of sulfates which effectively cut through your natural hair oils. Dry and brittle hair is the result of using shampoos that contain isopropyl alcohol and sulfates. Shampoos containing alcohol result in frizziness. Overexposure to isopropyl alcohol over time can lead to the same nervous system effects as ethanol. Parabens are another ingredient found in traditional shampoo. Parabens have a toxic effect on the body and disrupt your endocrine glands. Using organic shampoo allows you to have soft, manageable, and moisturized hair without any harmful ingredients. Organic shampoos may contain natural essential oils such as peppermint oil or lemongrass oil. Peppermint oil causes hair growth, increases dermal thickness, follicle depth, and the number of follicles. Lemongrass oil has a soothing effect on an irritated and itchy scalp. Rosemary oil is a potent ingredient found in organic shampoos that reduces hair loss. One ingredient that you will typically find in shampoo is propylene glycol, which is also antifreeze. Not only is this ingredient a skin irritant, but it is also potentially toxic to your organs. It enhances your skin’s absorption ability and is related to allergic contact dermatitis. Heavy duty surfactants and sulfates are used to provide the “soapy” effect. The consumer may assume that a shampoo product is working well because of the foaming agent when these ingredients are toxic. Surfactants are acidic and irritating to the scalp over time while sodium lauryl sulfate or SLS has a drying effect on the hair. SLS breaks the surface tension of the hair, strips the hair of its natural oils, and allows hair to break more easily. Sodium lauryl sulfate is in industrial strength cleaners and engine degreaser products. Ammonium laureth sulfate is classified as a toxic ingredient but is frequently in traditional shampoos. This sulfate along with ammonium lauryl sulfate is a cancer hazard; causing reproductive and developmental toxicity. Sea buckthorn seed oil helps remove excess sebum from the hair and slows down the aging of the skin on the scalp. It also helps regenerate damaged hair by increasing its elasticity and smoothing the hair shaft. Look for shampoos that have as many natural ingredients as possible, rather than byproducts or man-made chemicals. Organic dry shampoo removes grease from the hair, adding body and texture. The product is relatively simple to use-mainly for when you don’t have time for an organic shampoo. To apply it, shake the dry shampoo well. Brush your hair thoroughly. Then, create a horizontal part on your scalp just above the ear and spray about four to five inches away from your scalp. Try to create an even spray down the part of the hair. Continue to do this across your entire head until you have generously sprayed from one ear to the other. Once you’ve covered the front section of your hair, continue with the back part of your hair. Spray the dry shampoo down each part of the back of your hair until you have thoroughly covered the back of your hair as well. After spraying, your hair will likely feel lighter and more refreshed. Wait for the dry shampoo to dry and then brush through your hair again, and that’s it-style your hair as you normally would. Organic shampoo is the best choice for your hair, allowing you to maintain healthy hair by stimulating and moisturizing your follicles rather than irritating them. You get the benefit of well-kept hair without having to worry about harmful ingredients on your body or in the environment. There are many plant-based extracts, oils, and other natural components that will help you solve hair problems-from dandruff to itchiness to hair loss. Dry shampoo is an easy way to take advantage of all that organic shampoo has to offer. Just brush your hair, parting and spraying until your hair is clean and fresh.